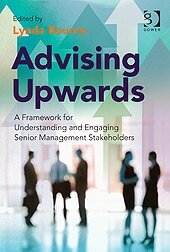 Today I’m interviewing Dr Lynda Bourne, author of Advising Upwards: A Framework for Understanding and Engaging Senior Management Stakeholders (Gower, 2011). Lynda is CEO of Stakeholder Management Pty Ltd, a training and consultancy firm based in Australia. Lynda, your book is about helping project managers communicate better with executive stakeholders. Let’s start at the beginning. How do you define a stakeholder? Individuals or groups who are impacted by or can impact the work of an organisation or the outcomes of that work. This is a far wider definition than is normally used: it is important to make sure that the stakeholder list is not just the ‘usual group’. Thinking in wider terms about stakeholders ensures that the ‘nasty surprises’ – not powerful but influential, are identified as early as possible. One of the things you discuss is how hard it is for middle managers who have just been promoted into senior roles, and you say that project managers should be aware that their executive stakeholders may be finding their new jobs difficult. Why is it difficult for middle managers to adapt to senior jobs? Middle managers achieve recognition and promotions through competition with their peers: they have to be better and be seen to be better than everyone else. This is the culture of ‘command and control’ that has its roots in the military and in the building of the railways in the 19th century. ‘Command and control’ and competition serves managers well until they are promoted to the ranks of the executive (the ‘C’ suite). Suddenly they are required to exhibit a different set of leadership characteristics – the level 5 humility and will of Collins’s as described in Built to Last. Not only are they required to learn on the job, but with collaboration and delegation: a complete change of approach from what got them to promotion in the first place. Project managers must understand the management styles of their important stakeholders – whether they operate in the ‘command and control’ mode or have acquired more mature leadership styles. It is important to also understand that their senior stakeholders operate in the same uncertain environment that everyone else in the organisation experiences. A successful project manager recognises not only the specific management/leadership styles but also how best to ‘help their senior stakeholders help them’. OK, we all want our senior stakeholders to help us get the job done. What did your research show as the characteristics of project managers who are most successful at advising upwards? Recognition that relationships with stakeholders are most important to success (rather than the schedule, for example – the schedule is only another tool for communication). Recognition that building and maintaining robust relationships with stakeholders requires communication. Working to build personal and team credibility through proactive managing of risk and conflict, and building that reputation through appropriate information exchange with stakeholders. Helping stakeholders know what they need to do to support the project to success. Managing organisational work, especially projects, is never easy. People are complex; there is no ‘silver bullet’ in the struggle to gain consistent, sustained support from senior stakeholders. Those are the characteristics, but what do good project managers actually do? Ensure there is no conflict between the expectations of their important senior stakeholders. If there is conflict detected the project manager must work to negotiate an acceptable resolution with these stakeholders. The earlier the better. Communicate to all stakeholders, but especially the important stakeholders, information about the project in a way that best meets the needs of the stakeholder AND the project and project manager. Continue to ensure that the expectations of the stakeholders are understood and met – they may change during the project’s life. You have curated content from various experts to produce this book. What was the most difficult part about managing all the stakeholders on this project? Editing a book such as this is like the most complex projects! I invited colleagues who were experts in their fields. This meant that they were very busy and sometimes had difficulty meeting my deadlines. Some were accustomed to writing in their own styles and I had to manage the potential issue of my occasional edits (for style consistency). Those who were writing for the first time welcomed my input and are now moving to publish more of their work. It sounds like a challenge! Now the book is finished, how do you feel it can contribute to improving projects overall? Managing organisational work, especially projects, is never easy. There are so many complexities in getting the right level of support from senior stakeholders. They are so busy and need to be encouraged to even recognise a particular project. The contributions in this book provide insights and advice for those struggling to be ‘heard’. People are complex; there is no ‘silver bullet’ in the struggle to gain consistent, sustained support from senior stakeholders. While recognising that people are complex, and offering information about aspects of communicating to senior stakeholders, the book seeks to provide project managers and others needing to achieve successful outcomes in complex organisations with tools and ideas to improve their chances of being successful.